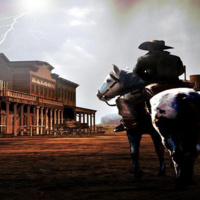 This one-act comic melodrama is set in a rotten wild west town filled with rotten people. Townsfolk spend their time drinking, smoking and cheating, and nothing makes them happier than an excuse to hang people… especially horse thieves. When a lone cowboy named Blanco Posnet is accused of stealing the sheriff’s horse, a trial is set, the locals demand blood and morality is on the line. Banned in its day, George Bernard Shaw’s “sermon in crude melodrama” explores concepts of morality, judgment, and hypocrisy through earthly and divine authority, and investigates the darkest parts of human nature. Director Steven York and a student cast present a staged reading of Shaw's little-known sermon on morality.